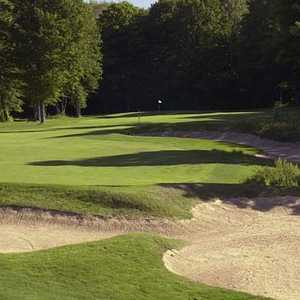 GAYLORD, MI - Of all the luxurious, memorable golf resorts in Michigan, none can boast the collection of courses and the general cache of Treetops. 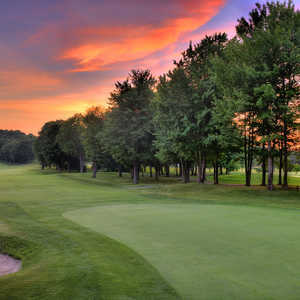 From the first tee on the only Tom Fazio course in Michigan, to the final green on the Best Par-3 Course in America, Treetops rightfully deserves every bit of the national attention and multitudinous awards it has earned over the years. Among the longest feathers in Treetops' cap is the fact that it is home to one of America's best golf instructors, Rick Smith. Teacher to pros including Phil Mickelson and Lee Janzen, Smith has been ranked the 5th best instructor in the nation by Golf Digest. But increasingly, Smith's reputation has been growing not only as an instructor, but also as a top-notch course architect. And Treetops is the location of his first 18-hole design, the Rick Smith Signature Course. 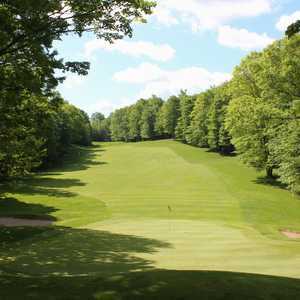 Smith, unintimidated by designing a course alongside the likes of Fazio and Robert Trent Jones, Sr. (who designed the original course at Treetops), has produced what is, in the opinion of many, the best course at Treetops. In the words of Scott Head, Treetops PGA pro, "The whole course looks like it's been there 100 years. That's why Rick is a real renaissance man when it comes to course design." This characterization is completely accurate: Smith meshes the dramatic topography of the north woods with green complexes and bunkering reminiscent of Old World courses. And at the same time, he treats players on this resort course to a "resort-quality" experience with his liberal use of bunkering and mounding, all adding to the overall playing experience. What is particularly noteworthy about Smith's designs, is that he does not shy away from eyecandy — striking sand traps that do not actually come into play, dramatic contouring from tee to green that makes shots look both harder than they are, and easier, depending on the angle. Yet despite his flair, these artistic extras don't in the least detract from the flow of the course. The par-70, 6653-yard Signature Course, according to several regulars with whom I spoke, is often less crowded than the Fazio or Jones courses, but it quickly becomes the favorite of many golfers who return year after year. Consider the testimony of one pretty good golfer by the name of Phil Mickelson, who told me at the Par 3 Shootout, "The Signature is one of my all-time favorite courses. The risk-reward situations make it so much fun to play." Indeed, Mickelson failed to show up on the practice range a couple of times during the week because he was squeezing in a few holes on the Signature Course. Ask five people what they consider the signature holes on the Signature to be, and they'll look at you funny and tell you, "All eighteen. That's why they call it the ‘Signature.'" And pretty much from the get-go, you come to realize that it's not just a catchy name — these are a fabulous 18 holes, without a weak or dull one in the bunch. And ranging from 6,653 yards from the tips to 4,604 from the forward tees, with five sets of tee stations, this course is playable and enjoyable for both Mickelson and the average duffer. No. 3, a 467-yard par 4 (443 from the blues) is typical: Elevated tee, wide fairway, nine fairway bunkers (just four in play for most golfers), and an elevated green protected by more sand, but approachable with a wide variety of shot shapes. Just plain fun. The 186-yard 4th is practically something out of a dream, especially if you play it before the fog has lifted. The tee stations are nestled into a dense, primordial swath of indigenous ferns, which is designated as natural protected area (so topped tee shots are gone, don't even try to look for them). From these low tees, the green looks no bigger than a golf towel, with bunkers everywhere. However, the green is actually large, with lots of unpredictable undulation. And if the bent grass greens are running at 10+ on the stimpmeter (as they usually are), these undulations can wreak havoc. One gentleman, who has been organizing a yearly scramble at Treetops for many years, told me about how his four-man best-ball team FOUR-PUTTED from 15 feet on one of these Signature greens. Needless to say, take your time reading these breaks, or you might end up breaking your putter over your knee in disgust. At the half-way house behind the tees of the 556-yard 10th, take a moment and enjoy the view straight down the fairway, which looks oh-so-inviting as you're munching a bratwurst. However, if you stray right or left into the fescue, you'll be wishing you had ordered about six more beers at the turn to take the sting out of your double-bogey. The 175-yard 11th presents players with a simply breathtaking corridor through the trees and over yet more protected ferns. Shaggy-edged bunkers surround the left-to-right sloped green. Be very careful here not to go past the hole or, even worse, over the green. Nos. 11 and 4 are two of the most pristine, bucolic par-3s you'll likely find on any one course. The par-5, 485-yard 15th is, in my humble opinion, the signature of the Signature. From the forgiving landing area, it is all uphill to a deep, narrow green, which you can't see any of except for the false front. On either side, steep embankments block any approach other than straight down the middle. And bunkers directly out of a Scottish postcard ladder their way up both sides of the fairway to this stunning green complex. A pox on your house if you actually stick this green in two. On your way to the 18th tee box, be sure to stop behind it and take a moment to drink in the spectacular vista in the opposite direction from the hole, yet another example of why Robert Trent Jones, Sr. suggested the resort be called Treetops. Then prepare yourself for a wonderful closing hole for a short par 4. Only 363 yards from the tips, the 18th tempts you with a bulbous fairway and then teases you with an approach past traps, fescue and hills to an elevated green that demands more club than you think. So what more can you add about a marvelous course like the Signature? Conditions, practice facilities, clubhouse, resort amenities, service, etc., etc., etc. - all are as first-rate as you would expect from Treetops. At $98 for 18 holes with cart for non-guests ($79 for guests) during peak season, the Signature isn't a cheap course, but it's not out of line with the other numerous world-class courses in the area. And if you purchase a package deal through the resort during the off-season or play in the evenings, you can actually score a solid bargain, given the quality of the experience. What is truly remarkable is that Rick Smith's first effort at course design can stand shoulder to shoulder with courses by Fazio and Jones, Sr.. As one of the best instructors in the nation, though, it is obvious that renaissance-man Smith incorporated the lessons learned during many years of playing and coaching experience into the Signature. As he puts it, "This course is a culmination of my ideas on design and playability developed over the years." The result is a seamless incorporation of the traditional golf course architectural features with variety and dramatic effect.